It doesn’t hurt that Paul’s sister’s boyfriend’s mother (did you get that?) has a house with a pool around the corner from where we live. And she lets us use it pretty much whenever we want. She even brings us lemonade and pretzels while we float around in the sun, which reminds me of summers in high school when we lived at Emily’s pool and her mom would bring us popcorn. 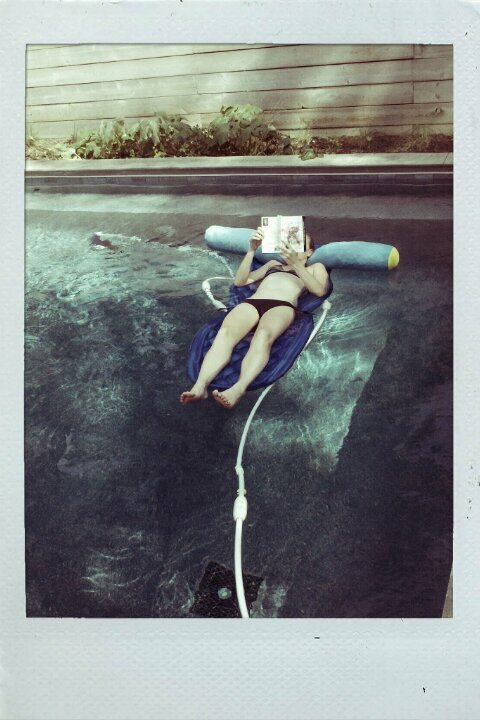 And now that I’m not doing 3 hour bike rides every weekend, this is what I do instead: lie on my floatie reading my book, drinking lemonade, getting sunburned, and dreading the end of August. It’s amazing. Anyway, the book I’m reading above is A Visit From the Goon Squad by Jennifer Egan, and I thought it was pretty phenomenal. Different format than most novels, almost a series of short stories, very fragmented and unconventional in both the narrative and the actual visual presentation. Really good. Recommend. You are currently reading Time’s a Goon at Rambulatory Ambulatory.